EPISTLES FROM THE SCRIPTORIUM: MUSICA CATHOLICAM "APEX"
K-tel is making a marketing comeback with this new Catholic collection - Music for the APEX Catholic. 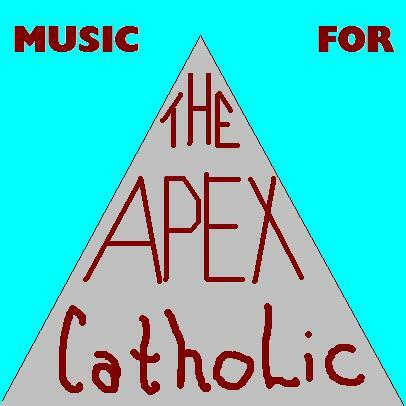 Twenty great cuts, all for that APEX Catholic in your life. 13. The Highway's One Foundation is traffic leaving Mass! 14. Joyful, Joyful is our exit, with Communion on our tongues. 16. Lift Ev'ry Voice and Sing... NOT! 18. Here I Am, Lord, What More do You Want? Some of these cuts may even apply to everyday Catholics. Maybe teach someone a lesson. All selections craftfully sung by that vintage Catholic gospel sensation, the Flip Flops! Order yours today! Note: Tracks 1-15 compiled by Brian Michael Page. Tracks 16-18 compiled by Jay Ricketts. Tracks 19-20 compiled by Bill Grabbe. This project was done in the early days of our Yahoo Group "Contemporary Catholic Music", back when it was a Yahoo Club. Eventually all Yahoo Clubs became Yahoo Groups. Jay is the group's founder. I am a co-founder.